Surrounded by large trees, lush landscaping and serene patios, it’s hard to believe Old Court Estates is just a short walk from so many modern amenities. 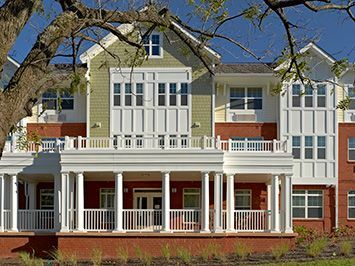 As the final phase of the Randallstown Campus, this 3 story, 51-unit co-op boasts beautiful architectural detail, along with a bright and inviting interior space for seniors 62 years and older to call home. Old Court Estates Co-op is nationally recognized as “A Community of Quality” by the National Affordable Housing Management Association and won the prestigious 2012 Vanguard Award. The property was completed in 2011. Old Court Estates Co-op is a healthy and safe environment to live in because it is 100% smoke free. Smoking is not allowed within the individual apartments and the common areas. At Old Court Estates resident members receive the best of both worlds. In addition to enjoying the privacy of independent-living apartments, resident members have the opportunity to stay active and social in the co-op community. Whether it be shopping trips, bingo, line-dancing, or organized day trips, the resident member life never has to be boring. Resident members work together to plan activities, make decisions for the co-op and organize continuing education opportunities. Sharing a campus with two other co-ops gives Old Court Estates resident members access to even more activities, opportunities and social connections. Old Court Estates Co-op is located within walking distances to a grocery store, convenient stores, pharmacy, banks, restaurants and public transportation. Old Court Estates is affordable for everyone. Every unit has subsidy and resident members pay only 30% of their income for rent. So don’t wait! Call for tours! Join us today! Old Court Estates Co-op is proud to be recognized as a NAHMA Communities of Quality Corporate Partner. This designation is for multifamily properties that have achieved a high standard of excellence in the way they are managed, the services they provide residents, the experience and training of personnel, and other criteria.